Let’s get this one out the way from the start, I was sent a pair of Salomon‘s new Sense Ride trail shoes to take on the Lakeland 50 and this will be the last time I bleat on about getting ill and missing he race…. I promise! Designed for most trail terrain outside of slop and true off fell routes, I had intended to run in a box fresh pair at the Lakeland 50 and instead have been using them for training runs and an 11 mile race since July. Having seen a vast number of Salomon athletes in 2017 in the Sense Ultra, the lighter stripped back S/LAB version, I was keen to try out a shoe many picked over the Sense 6 Ultra for long races. Initially I was told the Sense Ride’s may not be what I’m looking for, but what they turned out to be was a trusted companion. One which would leave the trail and become a daily wear. So much so, I have spent more hours wearing the Sense Ride in the office, around town and in general life than in the trail. And that’s simply because I wear them ALL THE TIME. They have been Mr Dependable, a shoe I know will keep my foot protected and cushioned regardless of the duration spent in them. I’ve even worn them running, after a day walking around. I’m willing to stick my neck out and say they were the best trail shoe I wore in 2017 and a product that doesn’t require you have to Kilian or Francois’ efficiency. If it’s good enough for Courtney Dauwalter to with the Moab 240 outright by over 10 hours, without feeling the need to change shoes, they have real pedigree for the long stuff. Some may look and say, well, they aren’t in red/black/white and have S/LAB emblazoned on toe and heel cup, but funnily enough, not all of us will benefit from Salomon’s top tier product…. (deep down I still want to see how the S/LAB Sense Ultra compare ;). I genuinely like the Sense Ride and it’s a product that is constantly drying this winter in my house from use. But, what makes it so good in my opinion. Top down, the obvious first port of call is the fit. Much like recent Salomon shoes I’ve reviewed, the combination of ENDOFIT™ and Speedlaces works for me. My foot is snug, I have very little unwanted movement, combined with the security and accuracy of the lacing. I can quickly slip them on for a session and there’s no faffing around to get the correct tensions or perfect knot. The welded over lays provide my foot the side structure I like and the I’ve had no issues of peeling off or early wear in 200 miles of running (note the shots were taken after 80 miles). The heel lock is secure and has not caused any abrasion or hot spots. I’ve only worn Stance socks in all my miles, but with this, haven’t had any problems. Much like the Sense 5 Ultra range of shoes which I’ve reviewed previously, the heel and upper combo don’t feel like much at all. It’s pertinent to add that I know some find Salomon and other brands of shoes narrow, so for this, trying on before you buy is essential. The Sense Ride does feel slightly wider in the forefoot compared to the Sense 5 Ultra. However, it is the mid and outsole where I feel the Sense Ride’s come alive. This is by far the most cushioned Salomon shoe I have run in and it still remains responsive and doesn’t numb trail feel. The Ortholite tongue and molded EVA in the sock liner provides enough cushion for small impacts, while the Midsole acts like plush Kashima coated stanchions (for the MTB riders out there) removing the more gnarly stuff. I’ve found the midsole to be the best feel for a cushioned shoe I have experienced (these aren’t Hoka’s, but if you read my reviews, you will know I couldn’t get on with their midsoles). To be blunt, the Sense Ride’s are fast. Seriously fast. The want you to run at speed and carry it. They can happily plod, but in my opinion are most alive when you drop your plan to the side of the trail and go out for the win. When I was flying (by my standards) around the New Forest, narrowly missing the podium at Maverick Races Dark Series, they felt more a kin to a road flat. And this is high praise given they are an 8mm drop. There are many tech names such as OPAL, VIBE and ENERGYCELL+, along with the more typical compressed EVA which go into the midsole. They are designed to work as one, providing shock absorption, cushioning, energy return and durability. In practice, they work and although I’m not about to emulate Courtney and run for 58 hours through the desert, I know they outlast me on the trail everytime. And then there’s the outsole. Looking at the S/LAB Sense 6 Ultra and Sense Ultra, I can see where they got it from. It’s more prominent then the Sense 5 Ultra and the trade off is substantially better grip. As good as the Sense 5 Ultra were, I live in England, it’s muddy, full of wet rocks and rarely bone dry and hardpack. Using Salomon’s Premium Wet Traction Contragrip®, the outsole does a great job of dealing with light mud, organic layers, sand and rock. It’s not super aggressive, nor is it minimal. If goldilocks were here, she would say it was just right for most conditions bar extreme. Could the Sense Ride be a bit of a Swiss army knife? So, the ride is comfortable, but not like bouncing on marshmallows, the traction is good for the depth of lugs and the upper does what it should do. What’s more to say? Aesthetically, I like the subtle lower band of pop and they aren’t like lead weights. 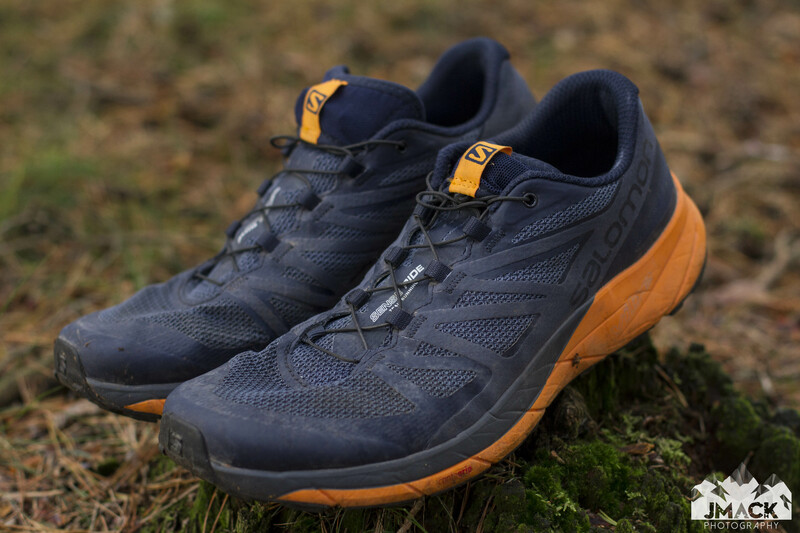 Salomon’s Sense Ride are more than just a training shoe or occasional racer, they are a trail shoe you can live in, race short or long, train hard and get your money’s worth it both miles and life. My pair are 200 miles in and the outsole and uppers are in great condition, along with the cushioning showing no signs of tangible ageing. If you’re a fan of Salomon’s trail shoes and are looking for something to put weekly miles into all manner of trails, I really don’t think you will go wrong with the Sense Ride. They may not be share the same spotlight as the S/LAB range, but that’s not necessarily a bad thing. My trail shoe of 2017. Hi Jonathan, interesting to hear from a development perspective and based on what you have said, I would say you met your objective.